Tales from a happy house. : A Shawl part two. I've noticed that while our life is in this current (temporary) state of disruption and flux, what with new homes, schools and jobs to contend with, that all I want to do is sew and crochet. I just really need to make pretty things, I need the distraction. More importantly, I need to finish pretty things, to feel the satisfaction of completing a project no matter how small. Last year I made my mother in law a shawl as a Christmas present. I enjoyed the process of making it and liked the pattern so much that I decided that, actually, I was a shawl person after all and that I quite wanted to make one for myself. My handmade scarves and cowls tend to be quite chunky and structured in shape, and quite brightly coloured as a rule. But this time I wanted something quiet, something muted and gentle to wrap around my neck a few times. I ended up choosing a very fine yarn to give a soft, lacy appearance to the shawl. I chose BFL sock yarn in Driftwood by Eden Cottage Yarns mainly because I just loved that blush pink-but-not-quite-pink. The pattern is the South Bay Shawlette which is in US crochet terms but very simple to translate. One skein wasn't quite enough so I bought a second, making this quite an expensive project but I think it was worth it as I cannot abide a too-short scarf. It's pretty big overall, longer than my arm span, and hard to photograph too as you can see here. I wear it like a scarf, with the point at the front and the two long ends wrapped back on themselves. I really love it. I've worn it almost every day this week. 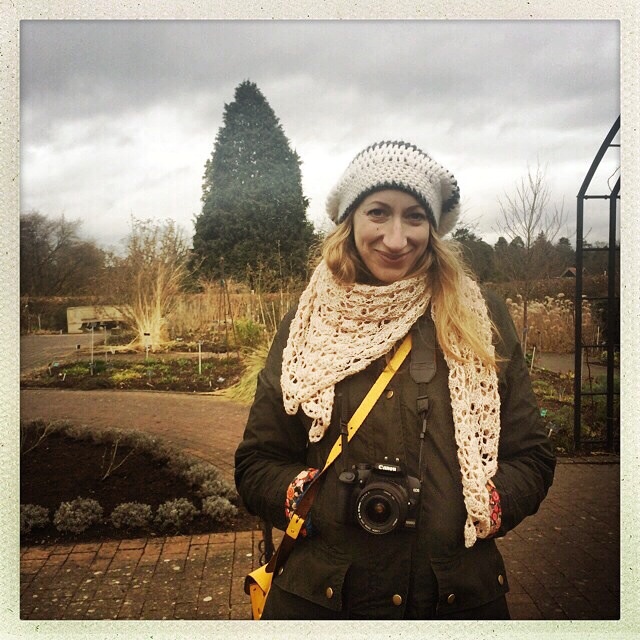 My friend Abigail took this photo of me wearing it last Saturday at Wisley. It doesn't really go with that hat, but it was cold. I needed that hat. I hope you all have a nice weekend. Mild temperatures and blue skies are forecast here which means that all of Britain is convinced that spring has arrived. My mum is talking about cleaning out the summer house so she can sit in it and bask in the sun. After many years living in Yorkshire I am more wary, however, remembering all those snowy Aprils and how long it took for it to feel really, truly warm. I'm interested to see how spring feels now we live on the south coast. What a gorgeous shawl. Such a pretty pattern and I especially like its fluidity! It is stunning. I have had that pattern marked forever on Ravelry. I had better get going on it. It's very beautiful. So clever! It's so pretty, Gillian. The delicate pattern works beautifully with the pale color. It looks very nice on you. You're looking blonder to me? I like it. Now that is a beautiful thing! Very nicely done, and I can imagine what a fabulous distraction it was from all your current upheavals. I wear my triangular shawls the same way, although all mine are knitted which gives them a clear right and wrong side so I end up arranging them quite carefully. Does that happen with crochet? Yes, there is often a right and wrong side with crochet, but with this pattern you flip the shawl over at the end of the row and work back on yourself, so there is no "right" side, which is very handy when I throw it on in the morning while rushing out the door! That is absolutely amazingly beautiful...stunning! I absolutely love it. I'm absolutely a shawl person and this one will be on my list of future to do. Great job my friend. The shawl is beautiful and suits you very well! Really beautiful !!! It suits you so well .... have a lovely week end ! That is a beautiful colour! And such a good example of a 'flow' craft piece that acts as a distraction from other worries in the real life! The shawl is beautiful and in such a lovely colour. Suits you! The shawl looks great, very pretty. I think this weekend may just be the weather teasing us into thinking it's spring. Enjoy it, most definitely, rely on it, not just yet! it really is so delicate, how talented you are! Such a subtle shade and it looks so pretty. Lovely photo of you to. You're shawl is absolutely beautiful. I think you'll still be needing it for a while too! It's so cold here - not that the temperature is very low but it is very windy. I was nearly blown off my feet when I was out! It's gorgeous and it looks lovely on too! I'd like to say you'll be pleasantly surprised by the southern spring but quite frankly I think you are right to be cautious! Just catching up. Your shawl is just exquisite and how proud you must be. Take care. It's lovely, I really like the look of the yarn:) It looks lovely and 'drapey'. I used to live on the South Coast (Cornwall) - I live in N.Wales now, on a quite high up farm and the temperature is a bit different! I'm the other way round to you! The sun is out, which is glorious, but I think it will be a while before the coat comes off! Perhaps I should make a shawl like yours:) Happy living on the South Coast, it's beautiful down there. P.s. do you happen to know how I can get a pic in my blue box instead of just a grey head (next to my comment?) !! I'm newish to blogging and following and commenting, still learning the ropes! For the photo, I think you just need to go into your blogger profile (click on your name in the top right corner of your blogger dashboard) then "Edit Profile". You should be able to upload a photo that way I think. Ok, thanks, I need to get a blogger account then, by the sound of it! It's beautiful, so delicate and pretty. And you look gorgeous wearing it too. Very pretty shawl and a great way to wear it. This shawl looks truely brilliant! :D I hope it will bring you lots of joy!